Crocodiles are large, prehistoric-looking reptiles that are found throughout the world's hottest tropical regions. The crocodilian family consists of 23 species, 14 of which are commonly referred to as crocodiles. Crocodiles in some form have been on this planet for around 65 to 245 million years. These large reptiles are the ultimate predators which is key in their continued success. Crocodiles range in size from the African dwarf crocodile, which grows to over 6 feet, to the Saltwater crocodile, which grows to over 20 feet in length. Crocodiles have large, broad bodies with short legs and long, muscular tails. They have thick, leathery skin with bony, plate-shaped scales. All crocodile teeth are pointed, cone shaped and located on the outside of the jaws. Crocodile heads are long and pointed with the eyes and nostrils located on the top of the head. Crocodiles never stop growing; the older the animal is, the larger it is and some species live for up to 75 years. Crocodiles are semi-aquatic reptiles and spend a lot of the time swimming. They are cold-blooded, like all reptiles, so they have to spend time on land warming up in the heat of the day. Crocodiles are found around the Americas, Africa, Asia and Australia in the warmest wetland regions. Their large bodies are generally more agile in the water where they use their powerful tails for propulsion. Crocodiles are entirely carnivorous and have the most potent stomach acid of any vertebrate animal, so they are able to digest bone and shell. They will feed on any animal they are large enough to tackle. In the case of saltwater crocodiles, this could be just about any animal. Smaller species are limited to smaller prey and some specialize in animals like turtles and shellfish. Crocodiles are ambush predators and will often swim close to their prey as it drinks from the river. The crocodile then uses its powerful tail to lunge forward so it can bite its prey, trapping it in powerful, toothsome jaws. 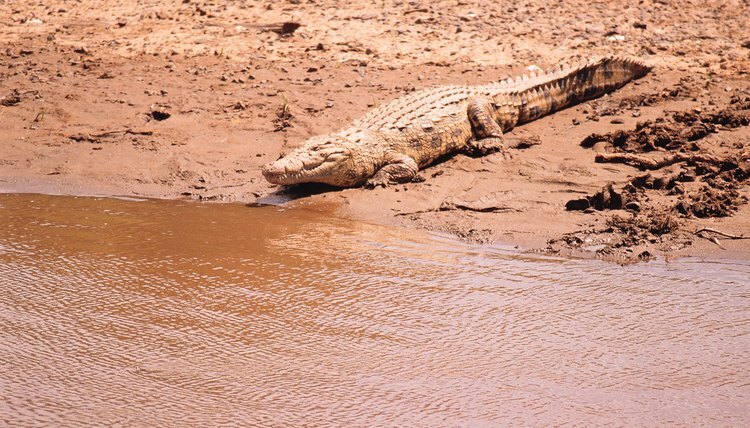 Crocodiles tend to be solitary animals, although sometimes will work together while hunting. In areas with an abundance of prey, large numbers of crocodiles will congregate. For breeding, males will mate with multiple females and not form an exclusive bond with any one individual. When laying eggs, females will either dig a hole in the river bank or form a pile of wet vegetation depending on species preference. The females will then protect the nests from danger until the eggs hatch. In some species the female will help the offspring to hatch out and most will carry their young to the water once hatched. For the first year of life the female will also tend to protect her young.